As reported earlier this year members in northern Europe had already heard from Elder Ballard and Elder Clayton back in March, so I was somewhat curious as to the purposes of this particular Europe-wide broadcast for members over the age of 18. This post compromises a summary of the programme and talks given. I will note at the start, that the wives of the GAs spoke with their husbands. Having a couple standing together like that at the pulpit is something I have only previously observed with our current mission president and his wife at our stake conferences. This gave the meeting a general air of cosy informality even though a programme was followed. Sister Ballard was unwell at home and did not attend with Elder Ballard. 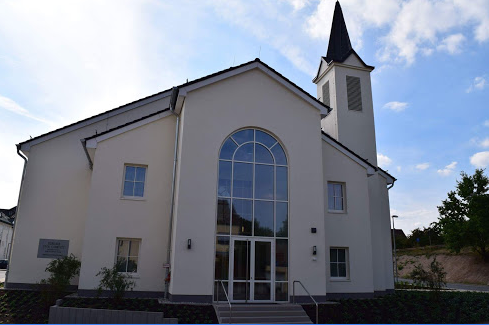 We started with a peek at Elder Ballard chatting informally with members in the Friedrichsdorf Germany stake centre, just by the Frankfurt temple in Friedrichsdorf. At one point he invites them to stand and stretch their legs because they’re going to be seated for 90 minutes. After some encouragement most members take the opportunity to do so. Elder Ballard related that in Q12 meetings they stand for a couple of seconds every hour. He isn’t sure that it’s always worth the effort getting up to be standing so short a time. He then invites the members to resume their seats and the broadcast begins proper. Conducting: Elder Massimo De Feo, comments how wonderful it is that we can be gathered together as one in Christ through technology. Musical Item: Mehr Heiligkeit Gib Mir (More Holiness Give Me) by a small choir of 9 men and 10 women. This was the only German we heard during a broadcast from Germany. Elder De Feo thanks the choir for the beautiful music, and the very nice spirit there was with it. It is a privilege to be with Elder Ballard. He is a prophet. We should listen to the spirit tonight, and note down what we’re told. We may be told to do something for ourself or our family, learn what to do in our life. Sister De Feo speaks in English. She is just learning. She has always loved the scripture in Joshua “choose you this day whom ye will serve” She has always felt the privilege and responsibility. She joined the church as a teenager. She had a desire to serve the Lord and have an eternal family, and married someone who felt the same way. The Lord blesses us according to our righteous desires. She is grateful for a young Joseph Smith who served the Lord to the end. She loves the Lord and desires to serve Him, and promises that this is what she will do. Elder De Feo says he is grateful for his wife. They have been together since she was 15. She waited for him on his mission and wrote many letters. She loves the Lord more than she loves him. He says that’s a good thing. He is happy to serve the Lord. He referred to President Monson’s invitation to study the Book of Mormon in the April conference and says he and his wife committed to do that. He referred to President Nelson’s and President Eyring’s testimonies of doing so during the recent October 2017 conference, of the power that comes. Elder De Feo recalled an experience after moving to Frankfurt. During the second night their daughter came into their room having woken from a bad dream. He tried to comfort her and give her advice, asked what she wanted to do, if she wanted to spend the rest of the night with her parents. His daughter asked if they could read the Book of Mormon together for a few minutes. He was touched by her request for this solution. Many times we make things too complicated. She knows the Book of Mormon is the word of God. His wife has always kept them on track. He thinks of President Nelson’s words about power. The source of power is Christ, but the Book of Mormon connects us to the pure doctrine of Christ contained in the book. He referred to John that “in the beginning… the word was with God, and the word was God” and became “the light of the world“. The words of the Book of Mormon open our hearts to Christ Himself. We plant a seed of the word and invite Christ into our lives. His family tries to live the gospel in a simple way. Alma talks of nourishing a seed. This can result in both fruit and roots. The fruits can be sweet, pure (describes the fruit of the tree of life in Lehi’s dream). He could see the fruits in his daughter. The roots can be seen by the way their children choose to live their lives after the way they have been teaching them. He is a happy husband and father because of the gospel. “we talk of Christ, we rejoice in Christ, we preach of Christ” They always advise their children to go to the Lord with their problems. There is hope in the gospel. There is happiness when we keep the commandments, covenants. He testifies of the divinity of the Book of Mormon. That night the Lord visited his daughter in spirit and will come for all of us in our darkest hours, bringing comfort, peace and hope. The Lord loves us more than we can understand. We can all go to the Lord and find peace, happiness and comfort. Section 64 of the Doctrine and Covenants talks about forgiveness. “I, the Lord, will forgive whom I will forgive, but of you it is required to forgive all men.” Leave it to the Lord to judge perfectly. We worry about things that don’t matter. Focus on the weightier matters: kindness, love. Things can seem upside down. We look through a glass darkly. When we know who we are things are clearer. We know who we are, learned from the restoration. Elder Ballard is descended from Hyrum Smith, brother of Joseph Smith. The first vision taught us who God is. There is much to be excited about. We can hope for a better world, abounding in good works. Glorify God. We can have a testimony of truth, understanding our identity, the gospel and plan. Elder Sabin appreciates Elder and Sister De Feo. He invites Sister Sabin to speak (who then joins him at the pulpit). Sister Sabin tells us she first felt the spirit as a pre-school child. Her mother would gather the children together and as part of their bedtime routine, would read to the children from the children’s version of the Book of Mormon before reading their bedtime story. She is grateful for the scriptures and feels the spirit when reading them. When Sister Sabin was a girl in primary her teacher taught about the plan of salvation, that life is not always smooth, there are challenges. Truth can be our guide. “God sent not his Son into the world to condemn the world; but that the world through him might be saved.” Heavenly Father is merciful. We have the opportunity to repent continually. In Lehi’s dream holding to the iron rod, or in other words, the word of God leads directly to the love of God, the fruit. She related this fruit to baptism and the covenants we make then and in the temple. She observed that the people who stayed at the tree were those who fell at the base of the tree, perhaps experiencing a lifetime of repentance. We have the opportunity to come unto Christ and be saved by him. We can pray and hope for those family members and friends who have left. Remember that Christ came to save not to condemn. Take time for those things that will truly save us and take us where we want to go. Elder Sabin closes their address by saying that if we are obedient we can be happy, if we are grateful we can be happy. We will always experience problems but we can be hopeful and faithful. Elder Clayton begins by thanking members for coming. This morning they met with the Stockholm South stake. They feel hope. They are going to be talking about the Sabbath from different perspectives. In Exodus 31:13 we read that our observance of the Sabbath is a sign we give to God about how we feel about God and about the atonement. The Sabbath is supposed to be a delight leading to a better, happier week. There are means of feeling delight. He recognises we all have different family considerations, different types of families. Sister Clayton says she will be addressing the practical perspective. It isn’t always easy for parents and children to feel delight about the Sabbath. As an example of what is not delightful she recalls a talk given in sacrament meeting in central America about Family Home Evening; the same principle can apply to the Sabbath. The speaker suggested that it was not an excuse for parents to give long, boring lectures to children. A small boy in the congregation applauded this remark. She recommends doing interactive fun things with our children on the Sabbath. In their home they kept a big box full of colouring books and games (such as name the prophet, name the temple) that was only accessible on Sundays for family activities. They also kept packets of cookie mix which required only the addition of water so that they could mix up a batch of cookies and deliver them anonymously to friends and neighbours. (Elder Clayton interrupted to say that they had to save some for him too.) They would role play scripture stories like the one about Samuel the Lamanite preaching to the Nephites. We can do delightful things, and delight in our children. Elder Clayton then asks: what about those who are childless, whether married or single? Elder and Sister Clayton then launch into an a cappella duet of the hymn Have I Done any Good in the World Today. On concluding the hymn Elder Clayton quips that that was the end of the punishment part of the meeting, and suggests members find someone else to think about and serve. Sister Clayton remarks that sacrament meetings are often not particularly immobile, and recommends maintaining a sense of humour and taking the long view. Arriving early allows the family to take their seats calmly. Families can discuss together what their goal is for sacrament meetings so that parents and children will have the same expectations. When her children were very small she counted it a great success if she made it through the sacrament ordinance without having to leave the meeting. Even though we might wonder what we are getting out of the meeting taking the long view we are establishing a pattern. Elder Clayton tells us that the sacrament service should be the apex of the week. It is the time we take to come before the Lord in whatever condition we are in and with whatever worries us. We can take time to think how well we’re really doing and what we really need. We are promised that we will have his spirit to be with us. The Lord will respond to us. In the long run things will turn out fine. We should turn off our devices and turn on our hearts and heads, seeking for voices of inspiration. Sister Clayton acknowledges that sometimes seven days can feel like a sentence. The Sabbath punctuates the week and gives us time to come up for air. She is grateful for that. The Sabbath is the air in the week. She recalls President Hinckley’s remarks that a new member needs three things. In reverse order: nourishment by the good word of God, a responsibility and a friend. The Sabbath provides these things. She loves the community of the saints. As a little girl she attended church alone, and has always felt that community. Elder Clayton reiterates that the Sabbath is our opportunity to demonstrate how we feel about the Saviour, reflect and consider and give God a sign. We should make a genuine effort to observe the Sabbath. He didn’t know he was going to have to follow Donny and Marie Osmond! Elder Clayton hit almost every note the right way. Elder Ballard served in the Bishopric for ten years during which time he and his wife went from having 1 to 6 children. His wife was exhausted on a Sunday, and he didn’t understand why she found the Sabbath so tough. He was released the week before Mothers Day, and on Mothers Day the Relief Society choir known as The Singing Mothers were singing and were seated in the choir seats. Elder Ballard was seated at the back with the 6 little Ballards. It was a disaster! Meanwhile his wife was grinning from ear to ear enjoying the spectacle. There is more to life than Walt Disney and colouring books. That’s why the meeting tonight is for adults. We recognise we are living in a very difficult world. Lucifer is raging in the hearts of men, as stated in scripture. We have a heavy responsibility as parent and adults. He is going to talk to us fairly straight. Will we still love him if he does so? He worries about the dangers of apathy. We can be busy doing so many things we don’t have time to sit and feel the power of the gospel. How do we find time in life to “be still and know that I am God”? Revelation comes in the quiet moments. It is a healthy thing to find some quiet time. All of us have challenges – we knew that we would. Yet we shouted for joy in the pre-mortal life at the opportunities to come afterwards. So here we are scattered over, he thinks 39 countries. He extends his love to us. Quiet time is required to recalibrate where we are, and what we are allowing to dominate our energy and spiritual capacity. President Kimball was president of the church when Elder Ballard was called as a General Authority. He was a relentless worker, but taught him. Elder Ballard was concerned about a young man in his ward whose mother had died of cancer. The boy was distraught and no longer believed in God. He was through with church. Elder Ballard tried several times to invite the boy to lunch at the church offices. Eventually the boy agreed. Over bowls of soup Elder Ballard tried to get him to refocus. During the meal 8 of the 12 apostles came over and asked the boy when he was going on his mission. The boy became more and more anxious to leave. As Elder Ballard accompanied him to the car park they met President Kimball who greeted them and carried on his way. The boy asked Elder Ballard if President Kimball would see someone like him. Elder Ballard rang the office, spoke with the secretary and President Kimball invited them up. President Kimball drew his chair close and told the boy that his mother was fine, but that she was worried about him. He explained about suffering and the things that he had suffered himself. President Kimball told the boy that the things he had suffered caused him to come to know God. The same was true of the boy’s mother. Life is eternal and his mother is gone for season. When they headed back to the car park Elder Ballard told the boy to take the afternoon off work and spend some time in contemplation and prayer. The boy agreed. He subsequently served a mission, married in the temple and raised children in the gospel. When we feel burdens in the path way , family members, what ever they are, we should find a few quiet moments and reflect on what is the church, what it is that we have. We are sons and daughters of God. We talk to the father of our spirits in our prayers. We are on a journey and have prophets and the Book of Mormon. We have so much guidance about our lives. We should of all people be cheery. In the Book of Mormon it asks “have miracles ceased?” Elder Ballard relates an experience he had in 1984 visiting Ethiopia during the terrible ’83-’85 famine. He was assigned as a member of the presidency of the 70, with Glenn Pace then head of church welfare to determine how to allocate $6M to help as many people as possible. The suffering he saw at the feeding stations has never left him. He wanted to be able to give them the gospel for them to have the strength to hang in there. At that time there was just one member of the church in Ethiopia; Brother Hadlock worked for Boeing in Addis Ababa. They were able to locate him, and the next day being Sunday they met with him for sacrament meeting. They took sacrament of crackers and water together. There were four people present, and all bore their testimonies. Miracles happen when we are struggling to know the mind and will of God. When it came to be Elder Ballard’s turn he felt that he should bless the land. He did so and asked that it should rain. On returning to his hotel he knelt and prayed about what he had asked for. At 3.30 rain came pouring down and people ran into the streets to collect the water. He saw what the water meant to the people. Every day that he and Elder Pace remained in Ethiopia it rained. We need to believe in miracles and be the focus of such miracles. The greatest miracle is bringing someone the gospel of Jesus Christ. The restored gospel. Don’t be afraid of that. Let the miracles work within us. They start on our knees when we ask to know his will and do his bidding, when we turn things over to heaven. The missionaries need miracles and can’t perform them alone. They need to come from us. We would all say we love the Lord. How much? He doesn’t require us to give our lives. The greatest way we can express our love for him is to bring souls unto him on condition of repentance. Find that quiet time. Keep your eyes open and watch what God can do. He told the Brethren that there was no agenda for this evening, just to trust the Lord and say what He would have them say. Elder Ballard’s wife isn’t here. She is unwell. She is his greatest weapon. We’d all do what he asked if she smiled at us. We need to build the church in Europe. We can’t let it shrink. We need a church membership to greet the Lord when he comes again. He asks Heavenly Father to bless us with miracles, with peace in our hearts and to feel joy in the church. Sit under a tree with the scriptures and ask for God’s help, and get it done and feel excited about being a member of the church. Have fun in church. Come to church with a smile and enjoy it. The Lord would like to be more active warriors in the battle. Elder Ballard has a testimony of Christ, the Son of God, the resurrected Saviour. Last Sunday was his 89th birthday. When he wonders how will he do it he takes his mind to Gethsemane and the things Christ endured to the very end. May the gospel be a precious treasure we want to give away in anyway we can possibly think. As always this is assembled from my scribbled notes made at the time. Any errors are mine, as is the choice of hyperlinks. *Thanks to a friend for catching that name. I missed it. Thanks to Mary Ann (see comments) for the link to the broadcast added 20/10/17. Hedgehog – thank you for this comprehensive summary. There’s obviously a lot of work that you put into it. There has been a lot of chat about the numbers of members and units in Europe recently. My wife and I recently went to Europe for the first time a few months ago and were actually commenting on the many differences between the “exported Utah church” with all its cultural accoutrements, and the various European cultures we encountered. I now see why the church is struggling to keep members on one hand, and expand on the other. Hedgehog, as always, thank-you for these summaries. It looks like the broadcast is still up on lds.org, so I’m listening now. I’ve heard Elder Ballard tell that same Ethiopia story before, at an October 2015 Area Business Weekend meeting to some young single adults. LDS_Aussie, yes there was a post over on T&S discussing the consolidation of units in Belgium and the Netherlands (here), and I wrote a post (here) a few years back. The cultural issues are real and also get discussed on the blogs from time to time (here, here, here, and here). I hope you enjoyed your trip. Mary Ann, thanks for that link. Brilliant. I’ve added it to the post. I hadn’t heard the Ethiopia story before, that I recall, I’ve definitely heard Elder Ballard talk about the time he was in sole charge of the little Ballards in sacrament meeting before though. So they call a special meeting, but don’t have an agenda. Do Europeans accept that they are living in a difficult world, or that satan is raging in the hearts of men? Then we have the story of thousands/millions starving (who very likely pray for help for them and their children) with no effect, but when an Apostle sees their plight, and after he goes back to his hotel, prays and instantly it rains. Not sure what the message is for those who are not Apostles? There is no concession that the political positions of the church with reguards to gays, and woman, could be a reason the church is not growing in Europe, and elsewhere. That in order for members to allign themselves with the church’s extreme political positions you find yourself in bed with extremists, who are often not pleasant people, anti immigration, anti muslem, anti women, and anti gay, and anti jew. I understand the new Primr Minister of New Zealand, Jacinda Ahearn, is a young woman who was raised mormon but left over the church’s attitude to gays and women. We could be boasting about a mormon head of state. She is the leader of the Labor party. What did you take from this special meeting Hedgehog? Probably a nuanced meaning of agenda here Geoff-Aus. Presumably there’s a purpose to the visit to Europe and the broadcasts (my daughter attended one to the youth broadcast from Rome yesterday evening, I’ll be writing her notes up shortly). I took it to mean he hadn’t assigned them specific topics to address. Quite a lot of British members I know would agree with the difficult world, satan raging scenario. For many that might mean increasing LGBT rights, personally I’d point to the rise of the political far right in Europe (though that varies from country to country), the British Brexit vote and the election of Trump in the US, increasing or at least more vocal misogyny and racism… I think there’s room for all to feel like things are gloomy right now, if we’re looking for reasons to support that statement. What did I take from the meeting? There were positives: I liked the Sabins’ emphasis on the weightier matters being kindness and love, and that Christ came to save not to condemn. And in the context it was given I took that to mean we shouldn’t be condemning others as well. The Sabins haven’t had an easy life (read here), so when they say “we will always experience problems but we can be hopeful and faithful” that means something. Elder Ballard’s talk, my tldr of that was: People, our area plan was to double attendance [I forget over how many years], and instead we’ve been shrinking! It’s going to take a miracle to achieve that goal now! My husband took the Ethiopia story to emphasize seeking out the one, though for me that got a bit lost in the extreme circumstances of the famine, that the miraculous rain obviously had not been enough to stave of another year of drought, so not a lasting miracle then… I found the story of the boy who lost his mother difficult, all that pushing on going on a mission from others. The other difficult thing was the conflation of the the gospel and of Christ with the church. Does bringing souls to Christ have to mean bringing converts to a church that as an institution is currently making it difficult because of things like the LGBT policy. Because I for one am finding it hard to keep hanging in there, never mind going out and promoting the church to others. On the previous day, Elder Ballard and Elder Clayton had hold a leadership meeting in Helsinki, Finland. Bishops, stake presidencies, mission presidents (+ wife?) and temple presidents (+wife?) from all Nordic countries were participating. On the Sunday morning, Ballard was having an extra stake conference in Helsinki. That conference was broadcast to all wards and branches in Finland. I think the real reason why Elder Ballard came to Europe was the leadership meeting (such meetings are hold roughly ever third or fourth year). Since he was coming to Europe anyway, he decided to have a conference in Finland and meeting in Germany. We are assured the 15 are not living in a bubble but have an understanding of the real world. My Stake Presenident tells me he has met a number of Apostles (his father was an area authority, stake pres, and mission pres.) and they are aware. Who would Elder Ballard have spoken with in Europe? Anyone who would explain the reason the church isn’t growing honestly? I have conveyed my concerns about the church being so closeley tied to US concervative beliefs, but my SP would not convey such concerns up the line. What is standard conservative thought in the US is extreme elsewhere. Yes many members throughout the world can not see the difference between the conservative us culture and the church, and can not differentiate between the church and the gospel. An example; members of my ward in australia, advocate reducing our gun controls, seeing that as being like utah mormons,I assume. Only very extreme people in Aus agree with this. I was questioning rather how likely the potential convert seeking the Gospel is to be put off by the conservative utah culture that comes as part of the package? Like yourself I find the opposition to gay marriage, and equality for women, to be conservative culture, should not be part of the church because it is in opposition to the Gospel. It also creates members who think being a good member requires taking on other conservative utah culture, such as guns. The miracle that would allow the church to grow again would be to teach the pure restored Gospel, which could be acceptable to many more. I look forward to your report on the youth meeting. I always find myself wondering what is the point of these (often very hyped) meetings from the perspective of the GAs. They never seem to say anything that I haven’t heard before. So is it that being in a room (or listening via webcast) is deeply inspiring in a way that makes people more orthodox? Is it problem solving somehow? The fact that Elder Ballard and others are traveling and working is inspiring, they’re really old! The brethren are trying to reach out, but I lament how formal – how hierarchical and impersonal that outreach is. Think about it. The story of a young man from SLC who met with President Kimball is over 40 years old now. That young man is a retired grandpa. The often cited story of President Kimball helping a mother with a toddler in a line at the airport is also now over 40 years old as well. It breaks my heart to think that such beautiful tales of prophetic counsel or service to individuals is a fading memory as they now fly private jets, meet with fellow leaders, and live executive lives. Over the past 40 years they’ve been retreating, cloistering themselves and speaking to leaders (mostly elderly men) in formal settings. Elder Hales had his “tie buddy ” ( a little boy with whom he corresponded for years and wore a special tie each conference for), but he went out of his way to have a pen pal. Most don’t. How is a simple child or average saint supposed to interact w the brethren? Answer: they cannot. You have to be a relative, famous, or well connected- really well connected. Primary children adore the brethren, but I can’t recall the last time they were the first reason for a visit. Likewise women are left out- unless you happen to be married to a leader, and even then you are likely uninvited as men do manly PH stuff. * GAs stay in members homes when they travel, and eat meals with them. * GAs attend primary, YW, YM and RS, EQ , or even the gospel principals class. * set aside a few appointments for regular folk when visiting an area. * go under cover. The pope sneaks out to serve as an ordinary priest to the homeless when he can. Cool, huh?? * have a hobby that involves meeting with members and non-members. Even GAs need balance. Perhaps President Hunter could have continued playing his sax in an old-timey jazz band that performed for nursing homes or he could riff with other bands as he traveled. President Monson could have kept his pigeons club. * manage your own social media sites. Right now, the public relations office re-posts their old quotes. I understand they can post themselves, but we never know who is talking. * come clean the buildings with us Saturday mornings. My understanding is that GAs eat meals with members (families of stake presidents etc.) almost every time when they travel. However, it would be nice to see them do many of the other things you mention. Mortimer. I love your list, but can see why logistically (and somewhat for safety of the GA) that would be hard. I’d think it would also be exhausting for the GAs that are more introverted and need that time alone in the hotel room/airplane to prepare for / recoop from the public receptions. Mortimer, There are some such efforts made by some GAs. They often stay in members’ homes (usually the stake president’s) and eat meals with them when participating in stake conferences. In connection with at least one stake conference, there were several GA visits to homes of members who were not stake leaders. I too wish we would see much more of the latter — such interactions could be very helpful to members and GAs. In the case I know of, the plan for such visits and for a separate Q&A meeting with invited sisters was initiated by local leaders and planned with the GA’s cooperation. Maybe we need a more concerted effort of local leaders requesting such visits to and meetings with members other than themselves. Some of your other suggestions might also be helpful, but would have to be initiated by individual GAs. I have wondered if it wouldn’t be a good thing for GAs to have reduced travel and meeting schedules (less preaching and telling others what and how to do things) and more ordinary interaction with ordinary members. But I’m glad I don’t make those decisions. Are you guys talking about stake president’s hosting the apostles and FP in their homes in the past 5 years? My ancestors used to do this 100 years ago, but the last couple times we’ve had GAs in my stake, they’ve stayed at the Marriott, dined alone or with the mission president/ temple president. Our GAs are for the most part, painfully introverted (Ballard, Packer, Eyring, Anderson being the most so, Monson and Uchdorf less so. Theu don’t get to lurch in and out of areas, always speaking at, never with us because of it. Sorry, being a minister means dealing with people. You can’t escape that. I’m glad to hear some of these things happen on occasion. I have t seen it, but am glad to hear some of you report it. What I have come to appreciate in my complaints, is the Savior’s ministry to women, families, children, and the unimportant, not so much so to the Pharases. Mortimer, Yes, in the last 5 years. I wish we also had much more of the interactions with non-stake leaders I described as happening largely because a stake president requested them. What feedback are they going to get from the kind of people who they do meet with? I don’t think the other speakers in this conference are going to explain to Apostles that the conservative Utah culture that comes with the Gospel, which includes discrimination against gays and women, but also members trying to out Utah the utahans. Or that Prophets who hold the position, but are unable to perform the duty, are not inspiring. There is a new Prime Minister in New Zealand who is a 37 year old woman, who was raised a mormon but left in her 20s because of gay marriage and treatment of women. Imagine the effect of that situation if she had become a democrat potus? Niklas, Thanks for that insight into earlier meetings. It makes sense, from a number of different points to get in as many things as they want to do while they’re over in the one trip. Certainly Elder Ballard isn’t of an age when he wants to be dashing back and forth across the Atlantic. Jet lag can be horrible, so to put together as many meetings as needed for one trip to Europe, even though it means flying between different European countries for different meetings in one day, the time zones won’t be an issue. Geoff-Aus, the youth conference notes are now up. We certainly get our share of British conservative members who sometimes take the lines they’ve heard from US members. For example, I’ve heard of few times over the years members saying they didn’t apply for unemployment benefits on occasions when they were out of work, because of the evils of the dole propounded over the pulpit by church leaders in various times past. Why? That’s what they were paying their national insurance contributions for. And all the time they aren’t claiming they are also missing out on protections for their being unable to pay while they are out of work. Instead they don’t get money their families could well have done with and they get a hole in their contribution record.. And how do those kind of proclamations to the congregation in a testimony meeting make some of those who do claim feel? ReTx, well I often get the impression that these visits are pep talks. Certainly both this meeting and the youth meeting there was emphasis on participating in missionary work, bringing people to church. and injunctions that we need to be joyful (to the adults) or bouncing through life (to the youth). As though we are all of us such extroverts. Mortimer, great observation about the age of the anecdotes. Nothing from the internet age. Much of that has perhaps to do with the age of the leaders now compared to 40 years ago too. Are they well enough to get down with the ward members vacuuming the carpets and polishing windows? JR, Mortimer, ReTx, I understood that in my previous stake visiting general authorities did eat with the stake president’s family. The SP’s wife had a quick and easy desert recipe that went down well apparently. And last time we had an Area Authority at a stake conference one of my family members was visited on the Saturday afternoon. I don’t know that it’s something GAs have time to do here though. I don’t know that most stake presidents would have room in their homes to accommodate visiting GAs other than sharing a meal. Many have children still at home, and generally don’t have particularly large homes. It would limit the pool for SP if that was an expectation. Finally, speaking as an introvert myself, I have to think it would be a blessed relief to get back to hotel room for a few hours down time , something not available as a guest in someone’s home. But yes, perhaps fewer meetings and more informal gatherings, though I can’t imagine how that would work, or that the members on the ground would be relaxed about it, given the celebrity status they have in the eyes of many. It strikes me that you are right. They are giving pep talks. I’ll have to think about it as perhaps that is why I find such events so un-engaging.